** Program price includes 4 vegetarian meals daily. CAMP REGISTRATION IS NOW CLOSED. Please call 530-272-9322 or email [email protected] to be put on the waitlist. Swami Vishnudevananda, the founder of the Sivananda Yoga Vedanta Ashrams and Centers, was the first yogi in the West to teach Childrens’ Yoga. We carry on this tradition at the Ashram by offering our annual Childrens’ Yoga Camp, a ten-day overnight summer camp teaching children ages 7-14 yoga, for the past 25 years. The Childrens’ Yoga Camp offers the opportunity for children to practice the teachings of yoga in a fun, inspiring, and energetic way in the peaceful natural environment of the Ashram’s 80 acres of beautiful land in the Sierra foothills, offering twice daily practice of asana (yoga postures), meditation, calmness and relaxation, compassion, healthy living, nature studies, hiking, painting, sketching, daily swimming in the pond, participating in outside games and play time, a drama production with music and costume crafting, and trips to the refreshing Yuba River. Karma Yoga will be introduced to the campers, including chores around the farm, cooking and gardening workshops, and caring for the animals. Our Childrens’ camp has been held every summer since the early 1980’s, for youth ages 7-14, and is led by our staff of certified and experienced Sivananda Yoga teachers.The ratio of counselors to children is 1:4, children have comfortable bunk-bed accommodations in camp cabins, and wholesome organic vegetarian meals are served 4 times daily. All children will benefit from daily Yoga classes and breathing exercises combined with relaxation. They will learn about and practice mediation, the value of Karma Yoga ( selfless service ) and have their own children’s satsang with daily singing and inspiring stories. There will also be plenty of time for swimming, fun and games, and special activities outside the Yoga Farm. The camp is an uplifting environment and ideal to create a foundation for your child’s peaceful and healthy development. We also offer a position for Junior Counselors, for campers who have been in our camp before, outgrew camp age and want to come back. Please contact us for more information. All pages on the below forms must be filled out with attached photos in full in order to complete your child’s registration. Swim suits and any swimhelpers your child might need (like a vest or goggles etc. ), sun hat and sun protection, easy to slip on shoes, small bag, pack, or extra bag for hiking and river outings, games to play for the kids (please no computer games though! We want to focus on simple things like nature), waterbottle. The total cost of the camp is $500. For multiple children attending from one family, there will be a 15% discount starting with the second child. If you are lacking funds to cover the cost for your children, please contact us. Can my child attend for a few days (shorter than the camp duration)? Children must attend the entire duration of the camp. Coming and going of children and parents as this disrupts the children’s energy and sense of security in the camp. For shorter visits, please consider our Family Camp. We are local and would like to send our child to attend during the day. May we register our child to join activities and pick up our child at the end of each day? “Daytime campers” are NOT accepted. When children come only for the day activities but go back home with parents at night the younger children find out and end up homesick, crying for their parents. May I stay at the Yoga Farm for yoga vacation or a course while my child is participating in the Camp? We encourage parents to give their children space for personal growth. 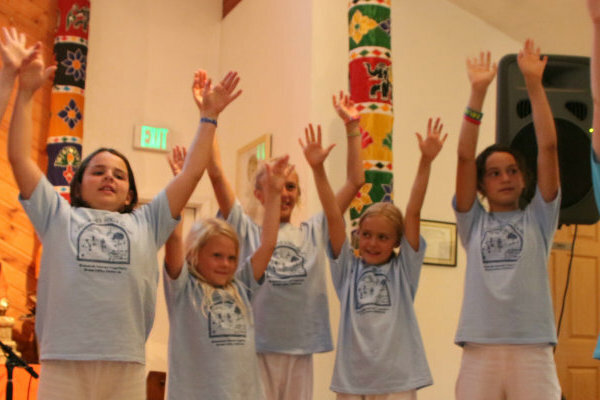 The Sivananda Children’s Yoga Camp is designed to build leaders for the future. The experience of independence and autonomy during camp is part of building those leadership skills. And from past experience, when we allow one parent to stay during the Children’s Yoga Camp, other children (especially the younger ones) witness this and a snowball effect of homesickness impacts a large group of children. If parents would like to have a yoga camp experience together with their children, the Yoga Farm also offers a Family Yoga Camp twice a year. What are the dormitory assignments like? I have a 7-8 year old child and would like to know they are safe at night. Campers stay in our “OM Cabins” up on the hill. The cabins are organized according to gender, separating the boys from girls, and ideally, a counselor of the same gender is assigned to each cabin (although we tend to have more female counselors than male.) Counselors occupy tents in between each cabin and are readily available. We may also assign a junior counselor (experienced camper age 14-18) of the same gender to live together in cabins that have younger children. They have been great supports for bedtime stories and good buddies for midnight trips to the bathroom! I am worried because this will be my child’s first time away from home. Can my child carry a cell phone or is there an opportunity for him/her to call home? Most campers who experience homesickness adjust within the first 2-3 days and are happy for the rest of camp. Separation anxiety is a normal occurrence for some campers. We have trained counselors to assist campers in dealing with this problem. The children will have one “Phone Home Day” in the middle of camp (Day 4 or 5) where they have the opportunity to make one phone call to a parent or guardian with whom they wish to speak. The call is limited to about 5 minutes per child. A list of parent phone numbers will be available for reference. We request that children leave cell phones at home. When one child has one and the others do not, this creates dissonance within the group. We also consider camp as a “digital detox” time for the children as most these days are attached/addicted to social media and video games. If any electronics (iPads, iPhones, game units, etc.) are found they are collected and returned to the children the last day of Camp. For business and emergency purposes during camp, please call 530-292-9322. I live locally. Can my child come just for the day to join the activities and leave in the afternoons? No. Unfortunately we do not accept “day campers”. When younger children witness another child going home, counselors have to deal the with resulting wave of homesickness. If my child cannot stay the full 7 days, can (s)he stay and join the camp for just a few days? Children are encouraged to stay the full 7 days for maximum benefit. Shorter Family Yoga Camps are also offered by the Farm and can be considered. When should I drop of my kids? When should I pick them up? Drop off/Registration – Friday, July 12th between 12:30 and 2:30 pm. Pick up / Graduation – Friday, July 19th @ 12:30 is Graduation. Can I have my friend drop off my child at the Yoga Farm the first day of camp? A “Child Care Authorization” letter must be written and signed, including a photo copy of the temporary guardian’s driver’s license. Upon submission of all of the above documents/payment, final approval must be made by the Camp Coordinator BEFORE arrival of the child to Camp. I have more than 1 child that would like to join the Camp, is there a family discount rate? Yes. For multiple children attending from one family, there will be a 15% discount starting with the second child. I cannot afford to send my child but feel it would be very beneficial for his/her development. Is it possible to get financial assistance or a scholarship? Yes. We don’t want finances to be a drawback to any child’s opportunity to benefit from this unique yoga education/experience that we offer. My daughter/son is over 14. Can (s)he be a junior counselor for the Camp? Yes, only if (s)he is 15-18 and has previously attended any past Sivananda Yoga Farm Children’s Yoga Camps (or any SYVC children’s camps in other ashrams like NY Ranch, Yoga Camp in Val Morin, Thailand). What does the role of a junior counselor entail? Junior counselors participate with the camp activities, but this time in a position as an assistant to the counselors. During activities junior counselors help keep an eye out for the younger campers and help gather the attention of the campers when being rounded up. There is also a 1-2 hour break for personal time away from all the group activities for reading, journaling, exercise, etc. Junior counselors are required to meet daily with the counselor designated as the “Junior Counselor Mentor” for debriefing, support and further guidance. **We would prefer our junior counselors arrive 1 day ahead of the campers to go over the new role and how it is different from his/her previous camp experience. This would also integrate him/her to working with the adult camp counselors. Is the tuition for junior counselors the same as the other campers? No. The junior counselor rate is only $280 for the 7 days. How does my child apply to be a junior counselor? An application must be submitted (normal application for Children’s Yoga Camp) with written indication of “junior counselor”, which is to be reviewed by the Camp Coordinator. Then the applicant still has to undergo an interview process via telephone, and a letter of recommendation from the applicant’s teacher or an adult in his/her community may be requested. The applicant must be in good standing and have shown proper conduct in past camps and an enthusiasm for yoga. Upon approval, the applicant may continue the registration process as with the other campers by filling out the supplementary forms and paying a deposit. My child is over 14 and has previously attended Camp but does not want to be a junior counselor. What options are there at the Yoga Farm for him/her to participate in yoga life? Youth 17 and over may be encouraged to take TTC (our yoga teacher training course) and, after graduation, may apply for a full-time Counselor position with the Children’s Yoga Camp. Youth may enroll in any appropriate ongoing courses, yoga vacation or as a karma yogi throughout the year. If the stay is simultaneous with the Children’s Yoga Camp, unfortunately, the Camp activities are only for those enrolled in the Camp.